The human brain is constantly analyzing the world around us. Consciously or subconsciously, we are always making predictions about what we see, and then we react accordingly to them. We are capable of labeling every object that we see, then file it in the deep recesses of our mind and retrieve it when required. How do we do that? How do we interpret what is in front of us and react accordingly? Our eyes collaborate with our brain through an aptly titled "primary visual pathway" so as to make sense of the world around us. The brain processes and breaks down what the eyes see through a complex hierarchical structure of neurons and nerve connections, giving us the ability to recognize, remember, and make decisions in as natural a way as possible. But then, one would wonder, how is this related to convolutional neural networks? Let us delve deeper into this comprehensive guide to understand convolutional neural networks and their importance in the modern world. Deep convolutional neural networks are most commonly associated with computer vision and can trace back its roots way back in the 1980s. Inspired by his research into the feline visual processing system, Kunihiko Fukushima proposed a neural network architecture which could not only recognize geometrical patterns in images but also generalize them and work out how the patterns appeared in other areas of the image. By 1998, CNNs were formally introduced, and the first neural network called LeNet-5 was soon able to analyze hand-written numbers and classify the digits within. But it was only when GPUs started getting more powerful and computer more ubiquitous that convolutional neural networks found their footing. In recent years, researchers have leveraged the power of convolutional neural networks for better handwriting recognition, warning systems for autonomous vehicles, medical diagnostics, biometrics, object identification, etc. CNNs are also significant when it comes to the field of data science, and the billions of dollars invested by tech behemoths such as Google, Microsoft, IBM, etc. show the enormous potential of this technology. Convolutional Neural Network Explained: How is a CNN Process Developed? The first basic premise of machine learning or deep learning is to teach the computer how to solve the problem using various examples. If the CNN process is being created for a fruit sorting line, then in that case data collection would involve taking pictures of different fruits of different types and in different conditions of wear and tear. This creates a set of images which are then fed to the computer, instructing it which image should elicit what type of response. One extremely important step in data collection is ensuring a large variance in the sample size of the data. This is sometimes done either by traditional image processing systems which churn out multiple variations of a single image or by applying systematic changes to skew the image so the computer recognizes it as a new image. Convolutional Layers - This layer applies a specific number of convolutional filters to the photo. It recognizes each sub-region in the image and performs complex mathematical steps to reach an individual value in the output map. Thereafter, a ReLU (rectified linear unit) activation function is applied to the overall output to introduce non-linearities into the prototype. Pooling Layers - In this layer, the photo data extracted from the convolutional layer is downsampled to decrease the processing time. There are many pooling algorithms which are employed based on the nature of the task. Max pooling is one such algorithm which extracts the sub-regions from the feature map, keeps them at the maximum value, and gets rid of all other irrelevant values. Fully Connected (Dense) layers - In this layer, the full classification of the features obtained from the above-mentioned layers takes place. Since it is a dense layer, each and every node in this layer is connected to a node in the previous layer, much like what you see in brain neurons. The precise structure of a CNN is heavily reliant on what the requirement is, and most famous CNNs such as GoogleNet, VGG Net, or Alex Net have different layers which require specific adjustments to perform specific tasks. Once the design of the CNN is established based on the data, a self-learning algorithm is executed for the process. This algorithm is more often than not a part of the deep learning framework. Algorithms once again vary based upon the requirement and are independently responsible for configuring the free parameters within the CNN so that the network can train properly using the algorithm. Execution of algorithms is the most processor and GPU-intensive step since if dealing with a sample size in the millions, more powerful GPU servers are required. It is also important to remember that while executing the algorithm, developers must evaluate results throughout and make manual changes so that the execution is flawless. Once the CNN is trained with the algorithm, it must be statistically evaluated. This involves taking a set of sample images, directly feeding it to the computer, and compare them with the values calculated by the network. With this, scientists can determine the error rate, which in turn signifies how many of the image properties were correctly identified by the network. If the results are not satisfactory, one must again return to the previous steps and make necessary changes based upon calculations. To avoid such problems, scientists usually deploy cross-validation procedures which systematically separate the data during the training an evaluation phases so that it can be easily found out if the algorithm is working properly. Once data scientists are satisfied with the last step, then they begin transferring the trained network into a productive system. There are a variety of deep learning frameworks out there which offer the required tools to package the network elements into executable software libraries which can link with other system components. Good network design is extremely crucial in making sure the convolutional neural network fits properly on the target system and can carry out all the tasks. Recently, a computer running a proprietary CNN algorithm was able to beat a human player in the game of "Go". This game is considered to be more challenging than chess and is a huge leap in mankind's pursuit of human-like artificial intelligence. IBM is currently undergoing a $240 million project with MIT to advance the usage of convolutional neural networks, doubling down on the power of artificial intelligence. Cancer as a disease has confounded scientists and doctors for more than 10 years, and numerous research has been conducted to decipher how it occurs, and more importantly, how to stop it. CNNs today are also powering cancer research and in the treatment and diagnosis of prostate, breast, and lung cancers. The day is not far when AI-driven insights will soon start saving many human lives. Convolutional neural networks and neuroscience share a deep and common bond. CNNs mimic the foundation of how the mind thinks, and research today has come a full circle as neural networks are now powering neuroscience research as well. Scientists today are using CNNs to look at how neurons connect across synapses, grouping, and classifying what network does what in your brain. CNNs can soon have the ability to decipher dreams, and if this doesn't seem like the future, then nothing will! Imagine having the ability to not only know what your customer wants but being able to decipher what they will need in a week, a month, or even a year! We already see this ability in certain website's recommendation engine such as Amazon and Google. What we don't know is that most of this is being powered by CNN algorithms which continuously learn from your behavior and connect you to what you want in simple, easy steps. Today, many businesses are using convolutional neural networks and machine learning to kick-start their foray into a modern business world. Forward-thinking leadership is extremely important whether it is a large business or small and knowing where the company is heading and making sure the employees are ready for the challenges is of extreme importance. As a result, we see a proliferation of automated, intelligent programs that introduce smart automation into many important tasks, such as Salesforce automation, CRM tools, Supply chain tools, etc. CNNs are also increasingly helping leaders have access to intelligent dashboards, allowing them to think ahead of the curve. What we know about convolutional neural networks today is just the tip of the iceberg. 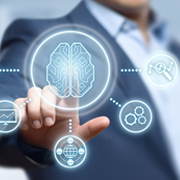 Technological advancements in the field of deep learning and artificial intelligence are now being made on a daily basis. Even if you have a team of data scientists who have mastered the basics of neural networks, you need a team of specialists who can help you keep innovating while helping your team implement new multilayered deep learning algorithms. Contact O2I to know more about how we are innovating in the field of convolutional neural networks and data sciences.